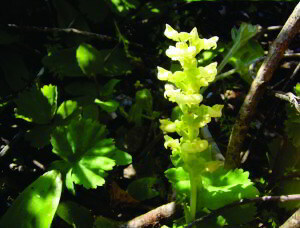 A robust plant with 2 basal leaves on the ground and several others gradually reducing in size up the flowering stem. Frequent on sand dunes. 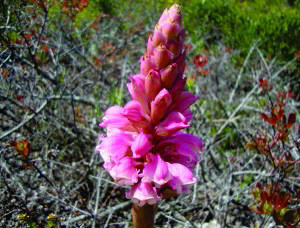 They flower for a short period in September – striking pink and easy to spot. Flowers from September to October more or less in the pathway. 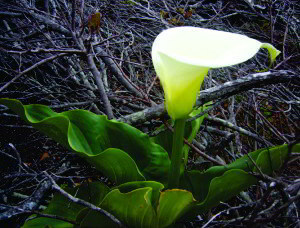 Flowers are either uniformly creamy-white, or with red marks on the lower tepals. 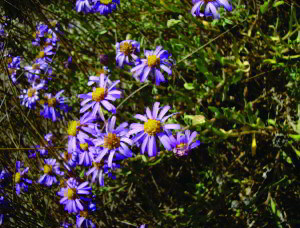 Flowering from September to October, seen often on the edges of the pathways. 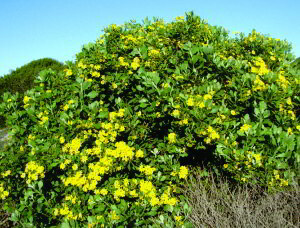 Densely hairy shrub to 1 m. Leaves toothed, greenish to golden yellow flowers with a yellow patch in back of throat, turning brown. 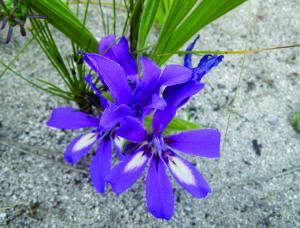 Flowering from August to October in coastal dune scrub. 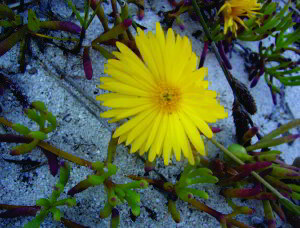 to October are most likely Arctotheca calendula or Cape weed, an aromatic annual herb. The yellow tips of these bushes make a striking display from August to October. 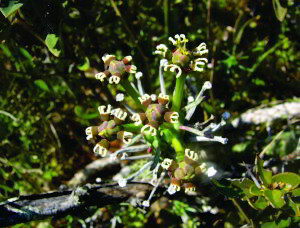 The plant contains a sticky latex which is usually poisonous or highly irritant. 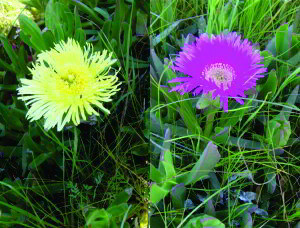 It flowers from September to November. Flowers from August to October. This creeping plant,with bright yellow flowers. has vertical succulent leaves like pencils mostly the same length. 4 lobes and the lower 2. 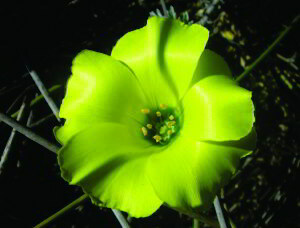 Often found with yellow Senecios. Flowers here from August to November. 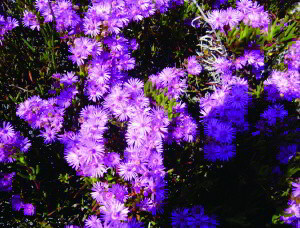 The bushes of up to 1.5 m are covered in white flowerheads and create a very prominent display. 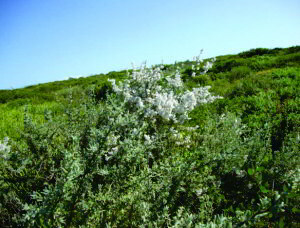 An erect grey-silky shrub of 1.5 m.
Has a fragrance similar to rosemary when touched and an important source of aromatic essential oils for perfumes. 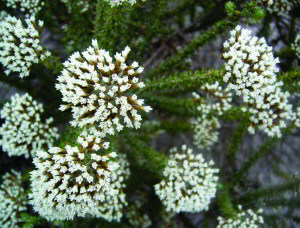 The small white flowers turn woolly after a while and the shrub has a snowy, or cotton wool appearance. Eriocephalus means woolly head. Can be seen from August to October. 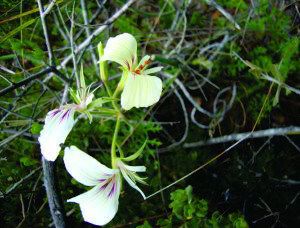 These plants grow from underground root tubers and appear here only under the Pelargonium gibbosum bushes. 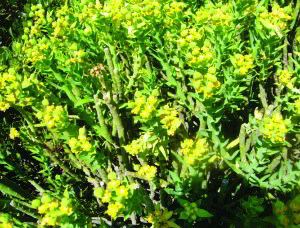 They are about 15 to 20 cm tall and bear greenish yellow flowers in spring. 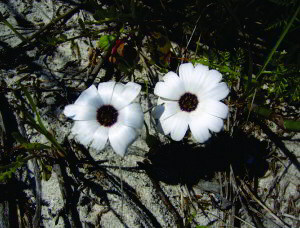 abundant on coastal dunes of the South Western Cape. Blue, violet or white ray petals. Hairy branched annual which flowers from June to November. Frequent in sandy places on flats and slopes. Certain species are used as dyes. 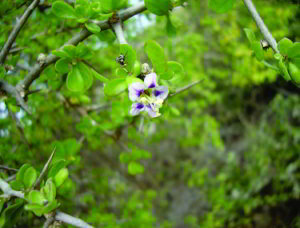 An attractive, spiny shrub with lateral branches. 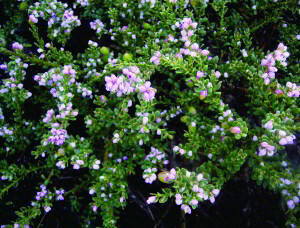 It is covered in small pink or white pea flowers that develop into dark orange edible berries in summer. 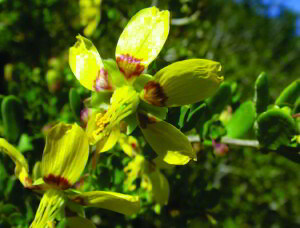 As early as 1685 when Simon vd Stel travelled to Namaqualand they were reported to be thirst-quenching. Flowers from September to January. 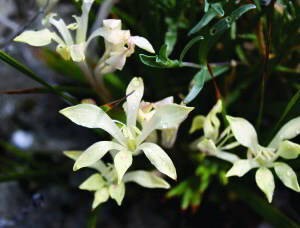 They are known as the porcelain bells of South Africa. 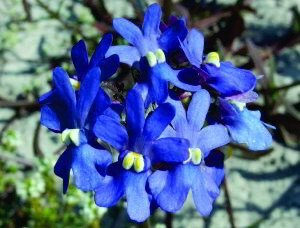 They grow from an underground rootstock which helps them to survive droughts and fires. There are 4 different species of Hermannia on this walk - all have nodding flowerheads. 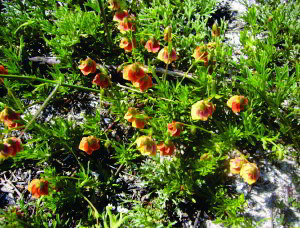 The flowers of this one have smaller openings and are yellow, but turn orange after being pollinated. 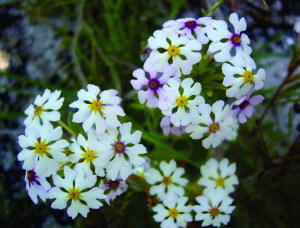 This plant is similar to morgsana with smaller leaves and flowers. The flower petals are reflexed. 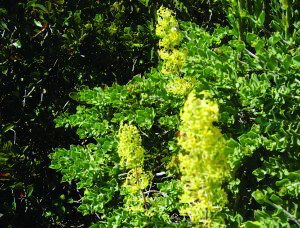 Thorny shrub of up to 2 m, flowering from July to October.